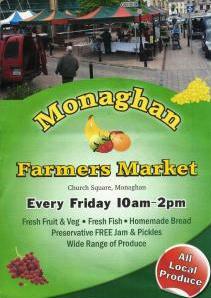 The Market has been a great success as it has given employment to some 19 traders each Friday morning on Church Square in the heart of Monaghan town from 10.00am to 2.00pm. Come rain hail sleet or snow we are there. Over this past year I have noticed as a stallholder that it is a great meeting place for young and old. It has many different stalls; most of the produce cannot be purchased in the local shops. Breda of “Good Things Farm” is busy day and night weaving her trellis and hand crafted baskets and other bits and bobs getting ready for Friday morning. At this time of year she is busy in her organic farm growing produce for sale later on in the season. Sean of Donegal Fish all the way from Killybegs is always busy at his stall with his tasty fresh fish he always knows how to cook them properly. And if you like delicious traybakes, you’ve come to the right place. Check out Joan Boyd’s amazing range of bakes – and enjoy a cheerful chat with Joan – every Friday at Monaghan Farmers’ Market. Now we have Willie Steenson, Cormeen Woodturnings with his woodturning creations, each Friday he has something why only last week he was showing me a clock he had in the shape of Ireland as well as many more bits and bobs Why not drop by and take a look Willie always loves to have a chat with everybody.